PARIS -- For three days, two al-Qaida-linked brothers and an associate who seized a kosher grocery, terrorized France and shook the world. The Kouachi brothers allegedly carried out the massacre of 12 people at satirical newspaper Charlie Hebdo, while their associate is suspected of killing a policewoman and wounding a street sweeper. On Friday, they hunkered down with hostages in separate sieges that ended in a blaze of gunfire and explosions. A chronology of the terror. Masked gunmen shouting "Allahu akbar!" 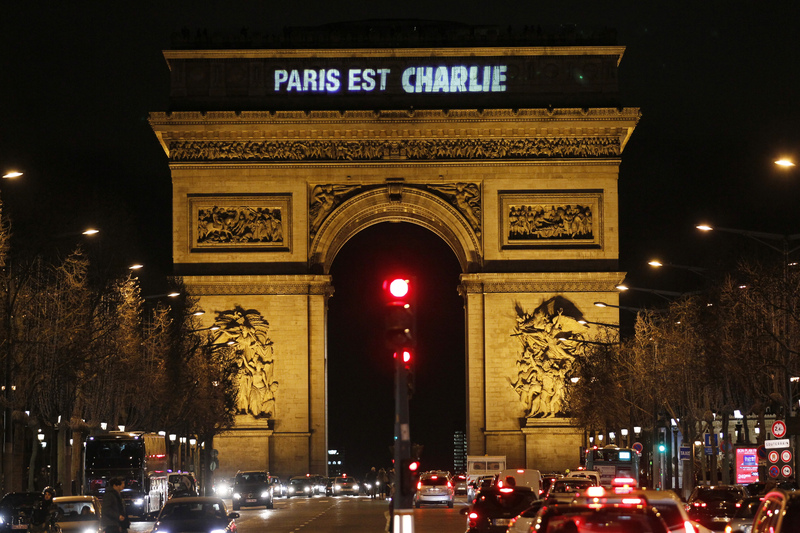 storm the Paris offices of Charlie Hebdo at noon during an editorial meeting. They head straight for the paper's editor, Stephane Charbonnier, killing him and his police bodyguard. With military-style precision, they go on to slaughter seven other journalists, a maintenance worker and a visitor. Making their escape in a black car, the gunmen pause to kill a Muslim police officer, shooting him in the head as he writhes on the ground. France raises its terror alert system to the maximum -- Attack Alert -- and bolsters security with thousands of extra soldiers and officers to guard media offices, places of worship, transport and other sensitive areas. World leaders, journalists' groups and others around the world express horror. "This is an act of exceptional barbarism," says French President Francois Hollande. French police identify three suspects: The two brothers Cherif Kouachi, 32, and Said Kouachi, 34, and a suspected accomplice, 18-year-old Mourad Hamyd. A witness quotes the gunmen as saying: "You can tell the media that it's al-Qaida in Yemen." Thousands of demonstrators jam the Place de la Republique -- Republic Square -- near the site of the shooting to honor the victims. They wave pens and papers reading "Je suis Charlie" -- "I am Charlie" -- a slogan of solidarity that went viral on Twitter. Similar rallies are held in London's Trafalgar Square as well as Madrid, Barcelona and Berlin. Hamyd turns himself in at a police station in Charleville-Mezieres, a town in France's eastern Champagne region. Heavily armed police move into the city of Reims, also in Champagne, apparently searching for the Kouachi brothers. Police release photos of the Kouachi brothers amid fears they will strike again. SWAT teams backed by helicopters hunt for them in the Picardie region north of Paris. Nine people, suspected members of the brothers' entourage, are detained for questioning in several regions. Fears of a backlash against France's large Muslim community are heightened when grenades and gunfire hit a mosque overnight in the city of Le Mans, southwest of Paris. No one is in the building at the time and no one injured. An assailant opens fire on a police officer in a pre-dawn shooting on the southern edge of Paris, killing her and injuring a nearby street sweeper. The suspect is later identified as Amedy Coulibaly. Police swarm a gas station in the northern Aisne region where the Kouachi brothers are reportedly spotted. At noon, bells ring out and Paris public transport stands still as France marks a moment of silence to honor the victims. At 8 p.m., the lights of the Eiffel Tower go out in tribute to the dead. Britain increases security at ports and border points. Authorities put more than 88,000 security forces on the streets of France. Four leading French imams and the Vatican issue a joint statement denouncing the Charlie Hebdo massacre. In a rare public speech, Britain's top domestic spy chief, MI5 director-general Andrew Parker, calls the Paris attack "a terrible reminder" that some "wish us harm." Security official says Kouachi brothers are on the move after stealing a Peugeot northeast of Paris. French Interior Minister Bernard Cazeneuve says an operation is underway to detain the brothers in Dammartin-en-Goele, about 25 miles northeast of Paris. The brothers are cornered with a hostage inside a printing house. Security forces backed by a convoy of ambulances stream into the small industrial town. Helicopters hover above. Schools go into lockdown and town residents are told to stay inside their houses. "They said they want to die as martyrs," local lawmaker Yves Albarello, who was inside the police command post, tells French television. A gunman takes hostages at a kosher grocery on the eastern edge of Paris, wounding several people. Police say the hostage-taker is armed with an automatic rifle and there are multiple hostages and wounded. A police official identifies the gunman as Coulibaly and link him to the Kouachi brothers. Police release his photo and that of a suspected female accomplice, Hayat Boumddiene, calling them "armed and dangerous." Coulibaly threatens to kill his hostages if police launch an assault on the cornered brothers, authorities say. Police order all shops closed in a famed Jewish neighborhood in central Paris, far from the two developing hostage crises. Just before 5 p.m., the Kouachi brothers came out from the printing plant with guns blazing, a French police official said. They were killed and their hostage was freed. Minutes later, police storm the Paris kosher grocery in another eruption of gunshots and explosions. Coulibaly and at least four hostages are killed. Fifteen hostages are freed. A member of al-Qaida's branch in Yemen says the group directed the attack on Charlie Hebdo.